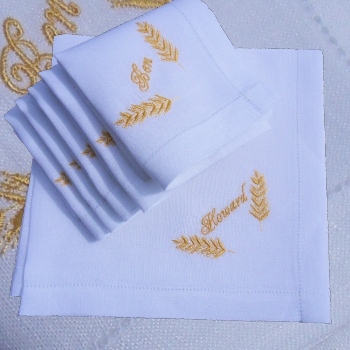 Embroidered wheat sheaf mens linen handkerchief. Single Irish linen handkerchief white with a punch hemstitched edge, made in Ireland. This luxury linen handkerchief can be embroidered with monogrammed initials, a name or a number format date personalised in between two stalks of golden yellow wheat. Enter the text your require in the option box and choose what lettering style you prefer. A single hanky is supplied, if you require more please add each to your basket. Optional Gift Presentation: Have your handkerchiefs in a Gift Box with a Personalised Printed Ribbon tied around. Select this from the Presentation menu. (Ribbon can indicate the occasion or who the gift is to and from!) Additional fees apply.